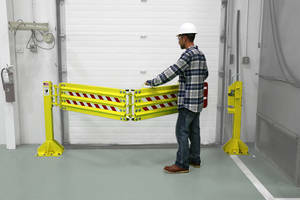 The Defender Gate Safety Barrier Gate System by US Netting is a superior dock safety solution. After continuous testing and abuse, our own gates have stood the test of time against personnel, fork trucks, and freight. Loading dock accidents are an important concern of US Netting that should be taken into account in any environment. US Netting offers a full suite of Defender Gate products that are engineered to be put through the paces. EasyGlide™ technology allows for our gate systems to open smoothly and easily adding to the longevity of the Defender Gate System. Years of input from logistics professionals, truck drivers, loss prevention professionals, and delivery drivers allowed us to construct the toughest safety barrier gate on the market. All of our gates are handcrafted in the USA and tested multiple times in order to ensure the safest gate with the highest quality available. We started at OSHA standard 1910.23 and realized that we need to be the company that pushed this standard to the limit. The gates stand 42” tall and each one is constructed in high gauge steel. All gates ship pre-assembled in 3 pieces and are quickly and easily installed to protect your loading dock or other hazardous areas. We have three different versions available each with its own identity on the loading dock solutions area of our website. 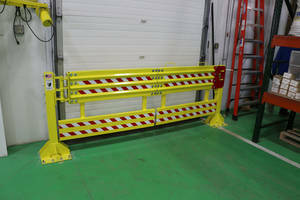 The first gate is designed for personnel and roll off protection for freight on the dock. The Standard Safety Gate which is a heavy duty steel gate with lockable latch for security. 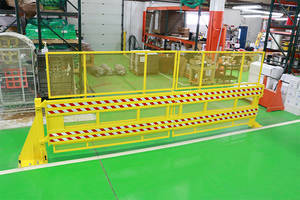 The Standard Safety Gate is an excellent solution when protecting workers from falling from your loading docks. Second, the Defender Gate features a lower additional cross-beam to prevent anything from rolling or sliding underneath the gate. The Defender Gate opens easily and smoothly and also features a locking latch mechanism for additional security. The Defender Gate works great when protecting your employees from dock accidents. 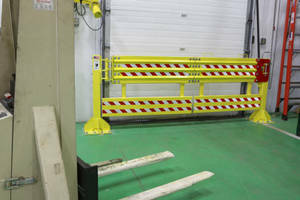 Finally, the Defender Gate Ultimate was tested and built for protection against forklift accidents on the loading dock. We tested the Defender Gate Ultimate with a forklift traveling at 4 mph. It took 7 repeated hits to take the gate out. Corrugated gate with steel stiffeners creates an extreme protection against hits and careless back-ups. This gate also features a locking latch mechanism and EasyGlide™ technology allows this gate to open and close easily and smoothly. 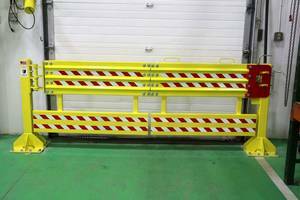 If you need assistance or have questions about any of the gates in the Defender Gate Safety Barrier System lineup please call us toll-free at: 1-800-331-2973. Our sales reps would be glad to help assist you in making your loading dock the safest in the world. US Netting, Inc. focuses on three things: Quality, Safety, and Solutions. Since 1983 we've been dedicated to building the best custom nets and continue our tradition of quality today. Our products help our clients offer increased safety and utility to their employees, facilities, and customers. Each custom net is tailored to the requirements of the job, providing the exact solution the project requires, something stock size products from big box stores cannot supply. Our team possesses a staunch devotion to fabricating the best nets available.